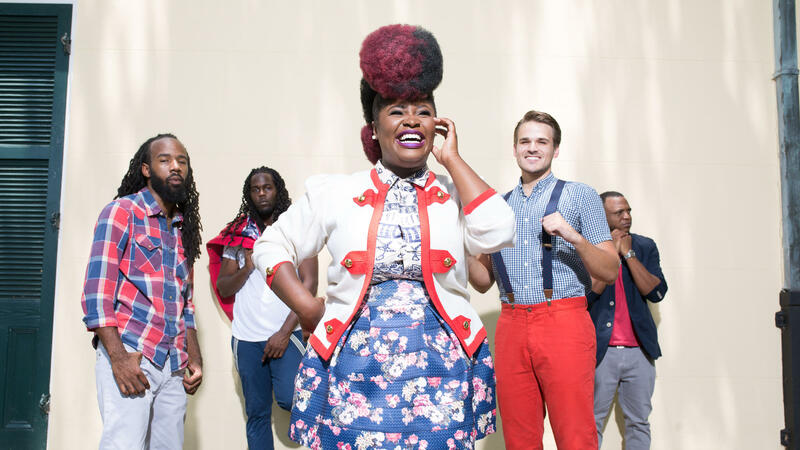 Tank and the Bangas won this year's Tiny Desk Contest. We have a winner. For the last three years, thousands of musicians have submitted videos to NPR Music's Tiny Desk Contest for a chance to come to Washington, D.C. and perform at NPR's home office. This year, the judges settled unanimously on Tank and the Bangas, a group of half a dozen young New Orleanians who wear their geography on their sleeves in their winning submission, "Quick." NPR's Ari Shapiro caught up with the band, led by vocalist Tarriona "Tank" Ball. Hear their conversation at the audio link, and read an edited version below." Ari Shapiro: I've got to start by asking where the name Tank and the Bangas came from. Tarriona Ball, a.k.a. Tank: "My nickname is Tank. My dad was in college — he played football, and they called him 'Cannonball,' and it would be so crazy that years later he would call me his 'Tank.' He passed on, and I really feel like I'm living out his dreams through the simple nickname that he gave me. It's kind of crazy that the whole world knows it now." Where does the word "Bangas" come from? "We started this open mic at this cafe that we used to be at called Black Star Cafe, and I guess they added Bangas on because you would go there every Sunday and the music would be bangin'." Tell me about the song that you submitted for the Tiny Desk Contest. "Well, the song is called "Quick!" One day, Albert [Allenback], the saxophonist of the group, was playing with beats in his room like he does. And he brought this to Joshua [Johnson] one day ..."
Joshua's the musical director and drummer. "Yes. And we were just playin' in the car and he was like, 'I want you to write something to this.'" Tell us about where you took it in this song. "The song is about a guy that tried to really get a girl and she's just planning on getting him back. It's about a high-speed chase; it has lot of elements, and the story is actually told backwards. "I don't know if you know this hand game called 'Down by the river called Hanky Panky, where the bullfrogs jump bank to bank'? That's how I got the first line, 'Down by the river where the green grass grow, where the sun be burning hot.' I have a lot of childhood memories that still stick with me a lot today, and it's always incorporated into music in some type of way. 'My back is achin', my bra too tight': It's hand games that we would play as little girls." You guys are a New Orleans band, so it's appropriate that we're talking on Mardi Gras. What is New Orleans about your sound? "One of the beautiful things that I guess I could say about Tank and Bangas, that a lot of people even from New Orleans know, is that we are very different from what is traditionally New Orleans. New Orleans has a good ground of beautiful, great music that's ... jazzerific, if that's even a word, that's brassalicious and definitely bounceaholic-anism. But if I was to take anything from New Orleans — definitely just being an entertainer. "In New Orleans, you could walk down the street and someone is standing still just for money. There are children tap-dancing for change. There's a brass band on the corner almost every night. And you just know that no matter what you're going through, that New Orleans wants you to know, for some reason, that it will be all right if we put a beat to your pain. It's just something about walking those streets and seeing people, old [people], start dancing like young boys when they hear certain music. You want to always carry on that tradition of what New Orleans is." We have a winner. For the last three years, thousands of aspiring musicians have submitted videos to NPR Music's Tiny Desk Contest for a chance to come to Washington, D.C., and perform at NPR's home office behind a desk. Here is who the judges chose for this year's honor. TANK AND THE BANGAS: (Rapping) Down by the river where the green grass grow and the sun be burnin' burnin' hot, take your buddy hold. Don't nobody know where you go. Just know the block just got hot (ph). TARRIONA BALL: I'm Tarriona Tank Ball. Hey, you guys. I'm Tank of Tank and the Bangas. SHAPIRO: Hey, you guys, congratulations. BALL: Thank you so much. BALL: It's so cool to actually hear the song, like, playing. SHAPIRO: I got to start by asking where the name Tank and the Bangas came from. BALL: Oh, wow. My nickname is Tank. My dad, he was in college, and he played football, and they called him Cannonball. And it would be so crazy that years later that he would literally call me his tank, you know? He passed on, and I really feel like I'm living out his dreams through just this simple nickname that he gave me. It's kind of crazy that the whole world knows it now. SHAPIRO: And where does the word Bangas come from? BALL: We started this open mic at this cafe that we used to be at called Black Star Cafe. And I guess they add bangas on and honestly - because you would go there every Sunday and the music would be banging. SHAPIRO: How many years ago are we talking? BALL: It was about six years ago. SHAPIRO: Tell me about the song that you submitted for the Tiny Desk Contest. ALBERT ALLENBACK: First of all - I'd like to correct the record, first of all. BALL: So you're not a lonely person. ALLENBACK: I'm lonely, but it's not sad. The dog was there. BALL: All right. I never said sad. SHAPIRO: It's a happy loneliness. BALL: And he brought this to Joshua one day. SHAPIRO: Joshua is the musical director and drummer. BALL: Yes. And we were just playing in the car, and he was like, I want you to write something to this. SHAPIRO: Tell us about where you took it in this song. BALL: If you really actually want to know what the song is about, which is fun, it is about a guy that tried to really get a girl. And she's just planning on getting him back. It's about a high-speed chase. It has a lot of elements, and the story is actually told backwards. TANK AND THE BANGAS: (Rapping) So I got to make a quick decision. I got to get out my feelings, see that money on the dash, never want to going to finish, never want to going to finish (ph). SHAPIRO: This song really goes through a lot of chapters. It goes into different modes. BALL: ...Where the bullfrog jump from bank to bank - but that's how I got the first line - down by the river where the green grass grow and the sun be burning hot. Like, I have a lot of childhood memories that still stick with me a lot today, and it is always incorporated into music in some type of way. It's like the - my back is aching, my bra too tight - it's hand games that we would play as little girls. SHAPIRO: You guys are a New Orleans band. It's appropriate that we're talking on Mardi Gras. What is New Orleans about your sound? BALL: ...And definitely bounce-aholicinism (ph). But if I was to take anything from New Orleans, definitely just being an entertainer - in New Orleans, you can walk down the street and someone is standing still just for money. There are children tap dancing for change. There's a brass band on the corner almost every night. And you just know that no matter what you're going through that New Orleans wants you to know for some reason that it will be all right if we put a beat to your pain. There's just something about it. There's something about walking those streets and seeing people - old - start dancing like young boys when they hear certain music. You want to always carry on that tradition of what New Orleans is. TANK AND THE BANGAS: (Singing) Oh, my God, my goodness gracious. SHAPIRO: Well, Tank Ball, Tarriona Ball, it's been great talking with you and the rest of the band. Tank and the Bangas, congratulations on winning the Tiny Desk Contest. TANK AND THE BANGAS: Thank you. Happy Mardi Gras. SHAPIRO: And happy Mardi Gras. TANK AND THE BANGAS: Happy Mardi Gras. TANK AND THE BANGAS: (Rapping) Who going to save me, save me, save me? Who going to save me (ph)? Transcript provided by NPR, Copyright NPR.